A little something from the archives until I find time to make new art. How cute is this painting!!!!!!!!!!!!!! Don't let Emma see it! 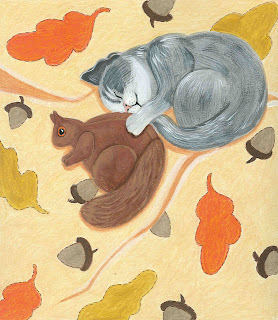 That would be an unusual sight seeing a cat with a squirrel snuggled up. Nice thought. This looks like a quilt. you did it! you posted! hurray!!! Awwww, so sweet! Beautiful photos from your Sunday post, hope you can make the trip soon! Cute drawing. I have seen mama dogs feeding baby squirrels. it's so sweet lo, the painting is charming and the sentiment too. i love the autumn theme. Aaaw a cutie, I remember it well. Am so glad you aren't hibernating again- but getting out there and spreading your wings! I always love your bold graphics. Sweet kitty with her little squirrel. I love your squirrels!!! And a cute kitty...a bonus! Adorable, Laurel!! !